June 22nd marks the 70th anniversary of Operation Barbarossa, Nazi Germany’s invasion of the Soviet Union -- the biggest military adventure in history, which led directly to the downfall of Adolf Hitler’s murderous regime. Together with the Holocaust that followed it, Operation Barbarossa was the ultimate expression of Hitler’s twisted vision, reflecting both the vaulting ambition and depthless cruelty of Nazi ideology. Hitler never offered many specifics about his grand vision -- perhaps because even he realized they were too shocking to be committed to paper. After years rattling around his hate-filled brain, in 1940 Hitler give the task of actually planning the colonization of Eastern Europe to his loyal henchman Heinrich Himmler -- the commander of the elite Schutzstaffel (SS) security force, and a man who rivaled his Führer in sheer crazed murderous ambition. In the broad outlines of Himmler’s Generalplan Ost (Eastern Master Plan), German victory in the east would inaugurate ethnic cleansing on an unprecedented scale. After the destruction of the Soviet Union, approximately 31 million “Slavic sub-humans” would be murdered, starved to death, or forcibly deported to Siberia to make room for 8-10 million German settlers. The groups to be “resettled” (which soon became a euphemism for murder) included all of Eastern Europe’s Jews and most of the Slavic populations of Poland, Ukraine, and Belorussia. Fourteen million Slavs would be sterilized and retained as slave labor. Although many members of his general staff were skeptical about the wisdom of invading Russia, Hitler’s fantastic vision seemed a little more plausible following an unbroken string of triumphs from 1936-1940. Remilitarization of the Rhineland in 1936 was followed by the annexation of Austria and Czechoslovakia in 1938. Britain and France finally declared war on Germany following Hitler’s invasion of Poland in September 1939 -- but the German Wehrmacht (armed forces) appeared unstoppable with the lightning conquests of Denmark, Norway, the Low Countries, and France from March-June 1940. And all this was merely a preamble. On December 18, 1940, Hitler issued a secret order to Germany’s top generals instructing them to begin preparing a massive surprise attack on the Soviet Union, codenamed “Barbarossa” after a 12th-century Holy Roman Emperor who won land for the Germans from the Slavs. The element of surprise was crucial, Hitler emphasized, because of the need to prevent the Red Army from withdrawing into Russia’s vast interior; German troops would drive deep into Soviet territory and capture millions of enemy troops in huge encirclements before their commanders had time to react. To accomplish this, Hitler’s generals planned a “blitzkrieg,” or “lightning war,” similar to the ones that destroyed Poland and France in 1939-1940 -- but on a much, much larger scale. As originally planned, the attack would begin in the spring, “no later than May 15,” to give German armies the most time for fighting before the grim seasonal deadline imposed by the Russian winter; the Red Army would have to be beaten no later than December 1941, or millions of German soldiers risked death by freezing. Underlying this breathtakingly ambitious strategy was the German general staff’s conviction that the Red Army had been fatally weakened by Stalin’s purges in the late 1930s, when the paranoid Soviet dictator executed 40,000 (or 50%) of his own top officers. Hitler had also lulled Stalin into something like a false sense of security with a non-aggression pact signed when the two dictators divided up Poland in 1939; in reality this treaty (like all Hitler’s diplomatic agreements) was nothing more than a “scrap of paper” to be treacherously discarded after serving its purpose. This included killing every Communist official — the infamous “Commissar Order.” Hitler justified mass murder by arguing that Bolshevik officials, left alive, would lead a guerrilla war threatening the German military’s lines of communication and supply. Indeed the same method -- summary executions -- would be used against anyone even suspected of supporting the partisan resistance. If guilty parties couldn’t be found, the Germans would simply execute everyone in the nearest village to make their point. In short, millions of people (mostly peasants) would be murdered for trivial or imagined offenses. Some of the officers objected to the “Commissar Order” and atrocities against civilians on grounds of honor; Field Marshal Erich von Manstein “told the commander of the Army Group under which I served at that time… that I could not carry out such an order, which was against the honor of a soldier.” But Hitler, anticipating the qualms of his professional soldiers, gave them an easy out: much of the dirty work of hunting partisans and murdering Jews would be left to about 3,000 retired policemen and petty thugs, operating as four roving SS death squads euphemistically termed Einsatzgruppen (“Special Action Groups”). In the final months before Barbarossa, personnel and materials moved around Europe on an unprecedented scale, as roughly 3.8 million men massed in four giant armies along a 820-mile front stretching from Finland to Romania. 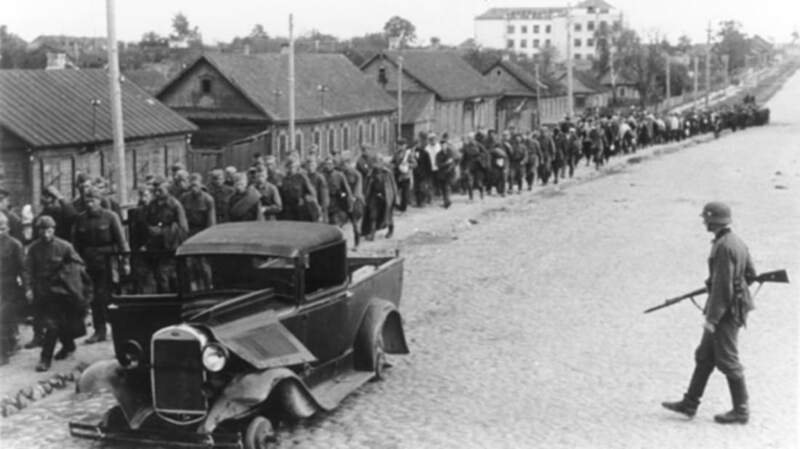 3.2 million German troops would be supported by 600,000 troops drawn from the Third Reich’s vassal states and allies, including 300,000 Finns, 250,000 Romanians and 50,000 Slovaks. In preparation for Barbarossa, the German military stockpiled 91,000 tons of ammunition, half a million tons of fuel (40% of all fuel available to Germany at the time), and 600,000 trucks and 750,000 horses to carry supplies. Speaking with his top generals on February 3, 1941, the Führer contemplated his vast gamble with typical nihilism: “When the attack on Russia commences, the world will hold its breath and make no comment.” But the world would have to wait to hold its breath. Hitler originally intended to launch Operation Barbarossa around May 15, 1941. But then (in typical fashion) a small Balkan intervention turned into a sweeping hemispheric gambit for control of the Middle East. In November 1940, Hitler sent German troops to support his embattled ally Mussolini, who’d launched an ill-advised invasion of Greece. Meanwhile, the hapless Italian ally also suffered a humiliating setback in North Africa after invading British-occupied Egypt; in February 1941, Hitler dispatched Rommel’s Afrika Korps to tidy up the situation. Then in May 1941, Hitler invaded Yugoslavia to crush the government established two months before by nationalist air force officers, costing him three more crucial weeks. Of course timing was of the essence: like clockwork, torrential rain would turn Russian roads into an ocean of mud by late August and temperatures would fall below freezing as early as October, with snow soon to follow. However, even though it was now a month behind schedule, Hitler decided Germany couldn’t afford to push back Operation Barbarossa to the next spring, arguing that the German Wehrmacht would never be as strong vis-à-vis the Red Army as it was now. And Hitler himself wasn’t fully in control, to hear him tell it: in February 1940 he divulged that “I follow the path assigned to me by Providence with the instinctive sureness of a sleepwalker.” A fatalist first and last, the Führer couldn’t wait to roll the dice. The attack came before dawn on June 22, 1941, commencing at 3:15 a.m. with the largest artillery bombardment in history, as 20,000 artillery pieces rained thousands of tons of shells on Red Army positions. Simultaneously 3,277 Luftwaffe combat aircraft launched a record-breaking aerial onslaught targeting the Soviet air force on the ground. Columns of tanks punched holes in Red Army defenses, followed by motorized and regular infantry, all supported by a continuing air assault, now targeting Soviet ground forces. The invasion had three main objectives. Army Group Center, consisting of 1.3 million troops, 2,600 tanks and 7,800 artillery pieces, mounted a massive drive on Moscow. Meanwhile, Army Group North, consisting of 700,000 troops, 770 tanks and 4,000 artillery pieces, drove north from East Prussia through the Baltic States towards Leningrad, with an assist from Finnish and German troops coming from Finland. Finally Army Group South, consisting of one million troops, 1,000 tanks and 5,700 artillery pieces, invaded the Ukraine with an assist from Romanian troops targeting the Black Sea port of Odessa. At first it looked like Hitler’s boldest gamble would be rewarded with his most spectacular success, as German and allied troops scored victory after victory. By December 1941, the combined German armies had killed 360,000 Soviet soldiers, wounded one million, and captured two million more, for total Red Army losses of around 3.4 million by the end of the year. In six months, German troops and their allies advanced up to 600 miles and occupied over 500,000 square miles of Soviet territory, home to 75 million people. But final victory eluded the Germans. For one thing, Hitler continually meddled with the schedule and strategy for Barbarossa, resulting in further critical delays: in September 1941, he diverted part of Army Group Center north to help the attack on Leningrad, and another part south to help capture Kiev. The encirclement of Kiev was one of the greatest military victories in history, with over 450,000 Soviet troops taken prisoner in one giant roundup. But Army Group Center’s push on Moscow -- the main goal of Barbarossa -- was pushed back by another month. The terrifying truth, now dawning on some officers, was that Hitler’s planners had drastically underestimated the strength of the Soviet military due to faulty intelligence and their desire to please the Führer. During the planning phase, they judged an invasion force of 3.8 million men in 193 divisions sufficient to defeat a Soviet military believed to number 4.2 million men in 240 divisions, including reserves. In reality, in June 1941 the Soviet military could muster five million men in 303 divisions, and this was just the tip of the iceberg in terms of Soviet manpower: from June-December 1941, the Red Army was able to field 290 more divisions, essentially creating an entire new army from scratch. Thus Stalin was able to collect over 1.25 million men to defend Moscow against the final German onslaught of the year, “Operation Typhoon,” from October 1941-January 1942, and then launch a bloody counter-offensive to push Army Group Center back from Moscow. The Soviets continued to suffer huge losses during these operations, but they were better-prepared than the Germans for winter fighting. And as luck would have it, the winter of 1941-1942 was the coldest in decades. The temperature plunged to a record -42 degrees Fahrenheit in late December, and by March 1942, 113,000 German soldiers had been killed or incapacitated by frostbite. Most German tanks were damaged and needed to be serviced, and gasoline was scarce. On December 2, 1941, German scouts spotted the spires of the Kremlin through binoculars, but this was as close as they ever came to the enemy capital. In short, Operation Barbarossa had failed. Although German armies would take the offensive again in spring 1942, this time the Red Army would be expecting it. And while Germany could draw additional manpower from allies like Romania, Finland, Hungary, and Italy, it also faced an ever-growing circle of enemies (principally the United States, after Hitler declared war on the U.S. in support of the Third Reich’s Japanese ally on December 11, 1941). German officers were apprehensive, and rightly so -- not just about the likelihood of defeat, but also the prospect of violent retribution for the terrible things happening behind the front. For one thing, almost no provision had been made for feeding or housing prisoners of war. As a result, captured Soviet soldiers were simply left to perish from starvation and exposure in cattle cars or open-air camps. Of the 3.4 million Soviet soldiers taken prisoner between June 1941 and February 1942, two million had already died by the latter date. Meanwhile, the four SS Einsatzgruppen embarked on the systematic mass murder of Eastern European Jews, shooting about 800,000 by the end of 1941 and a total of 1.4 million by the end of the war. In many places, the Nazis found willing accomplices among the local populations, where anti-Semitism ran deep. On September 29-30, 1941, Ukrainian collaborators helped Einsatzgruppe C murder 33,771 Jews in a ravine at Babi Yar, just outside Kiev, and Lithuanian mobs and militias murdered thousands of Jews before German troops even arrived. Cold-blooded as they were, these local killers probably never suspected the murder of the Jews was intended as a preamble to the colonization of Eastern Europe. But the changing fortunes of war forced Hitler and Himmler to put the rest of the insane scheme -- the deportation or murder of tens of millions of “Slavic sub-humans” -- on hold. Still, their murderous impulses would find expression elsewhere. Now over a million Western and Southern European Jews would pay with their lives for the failure of Hitler’s nightmare utopia in the East. After a verbal command from the Führer, Hitler’s stooges briskly hashed out the procedural details for genocide at the secret Wannsee Conference on January 20, 1942, leaving a helpful paper trail as they did so. The murder of 5.7 million Jews from all over Europe was just the crowning atrocity. Although some of the following figures are open to debate, from 1941-1945 the Eastern Front claimed the lives of about 25 million Soviet citizens (10 million soldiers and 15 million civilians) along with four million German soldiers, 300,000 Romanians, 300,000 Hungarians, 95,000 Finns, and 80,000 Italians. Poland -- which became one of the main battlegrounds of the Eastern Front towards the end of the war -- lost over 5.5 million civilians and soldiers from 1939-1945, including about three million Polish Jews.